We are thrilled to let you know that our little guy, Levi Paul, arrived last Sat (Aug 8) and we had an amazing birth experience 🙂 He was born one day past his “due date” and was a pretty quick birth! The Friday night I had a bath with some Clary Sage oil in it, which may or may not have helped things along…but also I was done my pre baby “to do” list and was feeling really relaxed about the baby arriving and had been visualizing his calm, easy birth. My water broke around 5:30 am on the Sat so I got up and waddled around as more fluid continued to come out and I had really mild surges (disposable underwear is fantastic!). We kept to our usual early Sat routines – Dave took our toddler to swimming, just 5 min down the road for a half hour lesson, I made pancakes for breakfast, and I did some laundry and changed bedsheets in anticipation of Dave’s parents staying at our place looking after our toddler. We called our midwife as my waters had broken (which we had been instructed to do), and arranged to meet at the hospital around noon to see where things were at. I was still feeling like everything was in early stages at 12:30 when we met with our midwife – she was actually not the one I had been seeing for appointments (we are part of a community program of 4 midwives who rotate at the hospital – so you see one midwife primarily, for antenatal appointments, and you have whoever is on call for the birth when you go in). The one who was on call last weekend was absolutely lovely and quite experienced, and made all the difference to our experience I think! We didn’t feel the need to let her know that we were “hypnobirthing” as she was very happy to let us do our thing and only became involved as needed. The only thing she did when we first got to the hospital was a 15 min fetal monitoring trace, and took my blood pressure and temperature – no internal exam or anything further. She suggested we go for a walk and see how I progressed, rather than go home…so we walked to a nearby shopping plaza (across from Caboolture hospital where we delivered), and had subway 🙂 I did a few squats as we walked and by 1:30 I thought we should head back towards the hospital as the intensity and frequency of my surges was increasing… we were in the birthing suite by 2 pm and I got in the shower to start with. We put the affirmations soundrack on repeat and just left that playing the whole time. I had listened to the affirmations a lot in preparing for the birth, and they triggered me to visualize my favourite place, to visualize endorphins being stronger than morphine, and to visualize going up and over a gentle wave with each surge. We used some of the massage oil the hospital had and Dave ran the water over my back and stomach and did some relaxation…then I moved to the tub and we continued with Dave helping me to relax and do my breathing, and helping me change positions and keep hydrated as the bath was quite warm so I was sweating more than I realized! He also added encouraging affirmations as my surges got more intense. I was in and out of the bath a few times needing to poo and then was shaky, needing to throw up, and needing to poo all at once – I thought maybe I was in transition but didn’t have a sense of how much time had passed – but yes, I then changed to gentle pushing and faster breathing and got out of the tub onto the fit ball. I leaned forward over it and was on my knees, and Dave continued to encourage me to relax which was needed by then as I found the pushing part very intense! They wiped Levi’s face off and handed him to me through my legs, then I carried him over to the bed and we spent the next couple of hours there. 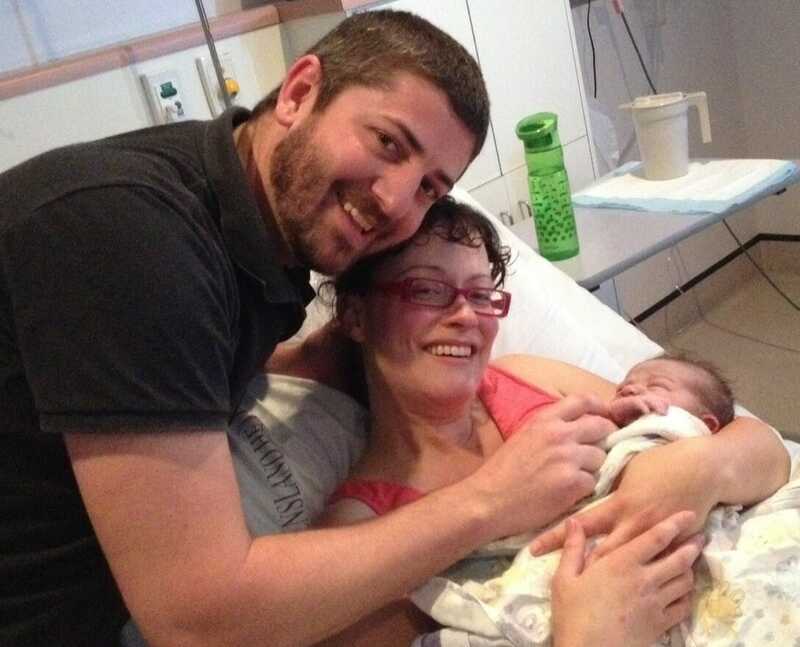 There was no pressure to have the oxytocin injection and the midwife was quite happy to just wait for me to birth the placenta…they waited until the cord was done pulsing to cut it (which Dave did) and we had lots of skin to skin time. We didn’t really have to ask for those preferences, the midwife was just very comfortable letting things progress naturally. The midwife didn’t give any coaching about pushing but did say when he was crowning to just wait before pushing any more and let everything stretch out (which I did). We really feel that the combination of hypnobirthing techniques, the midwife we had, and the birth circumstances we had, all came together to give us a really great birth experience!! We’re really grateful to you for the tools and information in your HB course. We came home the next day (Sunday morning) and have had a really good first week at home – Levi is a pretty relaxed baby so far and is nursing well and putting on weight really well. I am feeling absolutely fantastic compared to post-birth after our first! Dave has been off work and is off for another week – our toddler is gradually adjusting to his new baby brother and we have had some really sweet family moments with many more to come God willing!